We’re proud of the fact that we have a pedigree and heritage with roots back to 1935. This makes us not only one of the largest, but one of the longest established independent Leicester estate agents. With over 80 years experience we know that we can guide you through buying, selling or renting a home. If you’d like to find out a little more about one of our team or put a face to the name then visit our Meet the team page (they’re a lovely bunch waiting to help you). Easy. Although we feel that ‘a one-stop shop for all your property needs’ sounds a bit corporate (heaven forbid – something we’ll never be), it actually sums up what we do quite nicely. In a nutshell, we sell property, we let property, we value property, we survey property, we auction property; we do just about everything regarding property. In fact, we put great property on the map! We love what we do. We employ some of the best property people in Leicester. We’ve been doing it for a long time. We’ve evolved over the years to embrace some of the most innovative ways to offer our clients a great service. We know what we’re talking about. We tell the truth – even if it’s painful to hear sometimes. We think we’ve got the best staff and premises in the city. We can handle just about any property related enquiry. We are fully accredited and adhere to strict industry standards (scroll to the bottom of this page and you’ll see a list of logos including RICS, NAEA Propertymark and ARLA). We’re aware that we are judged on results so don’t take our word for it, read some of our customer testimonials. Who better to judge if we are good Leicester estate agents and letting agents? Charity Link is Readings Property Group’s chosen charity. We make a donation after every sale we make for this valuable cause. Charity Link provide everyday essentials to the most vulnerable in our local community, helping them to create a happy home. It’s Reading’s way of giving back to the community that supports us. With your support, we can really make a difference and help local individuals and families in need. 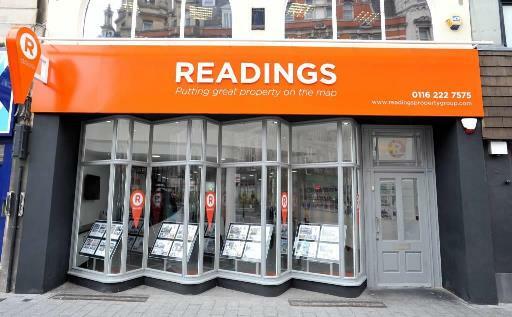 Contact Readings today and we will deal with your enquiry efficiently or pop-in to our offices on Granby Street and talk to someone face-to-face over a cuppa – we’d love to see you!